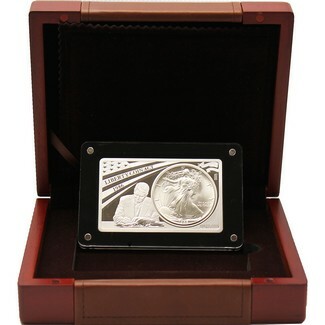 With a limited mintage of 500 this unique set commemorates the signing into legislation of the Silver American Eagle Coin (The Liberty Coin Act). The set includes a 1986 1 oz. Silver American Eagle coin within a 2 oz. Silver bar, also depicting the iconic subject matter. Coin contains 1 oz. of .999 fine Silver, bar contains 2 oz. of .9999 fine Silver. Comes in a wood presentation box with the Certificate of Authenticity.